Apparently, cemeteries are the new Michael Jackson. I've never seen so much cemetery news in so many prominent outlets in the same week. 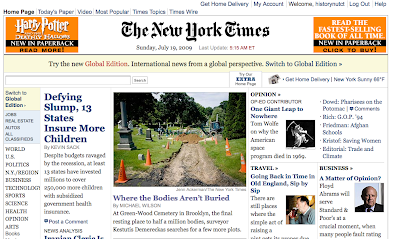 On the heels of the Burr Oak tragedy and the unproven allegations against Arlington, the New York Times has a front-page (of the online edition) piece on Green-Wood Cemetery in Brooklyn. The historian in me is very pleased. The hipster in me wonders when all of these tourists will go away. MILFORD, Conn. -- Police are checking Internet sites and art dealers trying to find the gravestone of a woman buried in a Milford cemetery in 1792. Milford historian Richard Platt noticed the gravestone of Mary Fowler was missing during a tour of the old Milford Cemetery on Saturday. He didn't report it to police until Tuesday, because he first thought it had been removed for repairs. Platt believes the slate slab with a macabre inscription was stolen by a collector or someone else who targeted that particular marker. The inscription refers to Fowler as "Molly" and says, "Molly tho pleasant in her day Was suddenly seiz'd and sent away How soon she's ripe how soon she's rott'n Sent to her grave and soon forgott'n." E-mail news tips to Eyewitness News, or dial: 866-289-0333. I hadn't heard — thanks for pointing me toward the story. I'll put this in a post so more people see it.